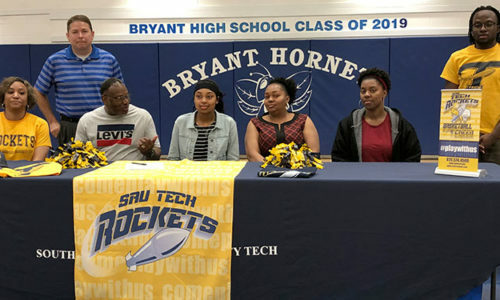 NORTH LITTLE ROCK — The Bryant White Lady Hornets eighth-grade team of Bryant Middle School closed out the 2018-19 season on a four-game winning streak including a rugged 33-31 win over North Little Rock Gold on Thursday night. With still a game remaining at Greenbrier on Monday, the Lady Hornets seventh-grade team improved to 7-5 (not counting a tournament at Cabot South on Saturday, Feb. 2) with a 27-8 victory. After starting the season, 3-6, the eight-grade girls finished the season 8-8 with Thursday’s win, which avenged two previous losses to the Gold team. Of the final four victories, three were payback. “This game was crazy physical with punches and fouls that would never be called,” said Lady Hornets coach Ben Perry. “Put it this way: Their coach got a technical foul on a minute-22 seconds into the game, it was so bad. “Through blood, sweat and tears the girls showed more heart and determination than I have seen from them,” he added. Jayla Knight led with 13 points. Lyniyae Johnson had 6 points with Lauren Lane and Haya Winfield adding 5 each. Kylee Fleharty and Brooklyn Welch scored 2 apiece. “This was a game that defined who these girls have become and what they are about,” Perry asserted. “We were determined to not get bullied and fight back. The game was tied 6-6 after a quarter but the Lady Hornets built a 13-9 edge by halftime. It was 19-17 going into the fourth. “With 3.5 seconds left in the game, we were up by one,” Perry related. “Jayla was at the line shooting 1-and-1 and made the first to make it a two-point game. She missed the second but had an opportunity to shoot 1-and-1 again due to a foul on North Little Rock against the shooter. “A timeout was called, and I set up for a defensive stop at half court and back court,” he continued. “Do not foul was the order. She missed the shot and North Little Rock got the rebound. They had a last ditch shot that did not go in and we won. “I stepped back to watch as the girls rallied around each other cheering and crying for joy to win a game that was just as much emotional as a physical win,” the coach said. “These girls have come so far since last year. They have found an identity that says we will fight to the end and we will not be pushed around. They now believe they should be feared by anyone and not the other way around. In the seventh-grade game, the Lady Hornets rushed to a 13-2 lead by the end of the first quarter and led 16-6 at the half. They held a 23-8 lead through three periods and held Gold scoreless in the final stanza. Brilynn Findley led the scoring for White with 9 points. Camille Calhoun added 6, Emeril Jones 5 and Kristen Reese 4. Raven Crump scored 2 and Locklan Berry 1. “We shot 2 of 6 from the line while not giving up a single free throw to the other team,” said Perry. “Everyone played hard and aggressive and fought for every ball. They are peaking at the right point and they are playing extremely well. They fought through bad calls or no calls and showed the heart of Bryant. “It was a good win and we look forward to Greenbrier to close out our season,” he stated.